Yesterday was my first visit to Babes with Blades. And I gotta admit: I was more than impressed. Why the hell has it taken me so long to check out this amazing group (especially since they’re gearing up for their 15th anniversary season)? 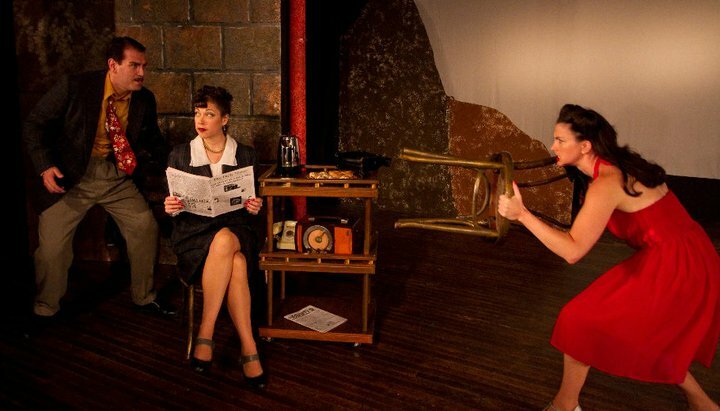 Blades ensemble member Barbara Lhota has penned a delightfully zany new play, The Double. Things start off a little unsteadily (it took me a while to decipher all the players and their inner romances and dalliances), but as soon as that all gets sorted out, the crowd-pleasing mayhem freely unfolds, leading to a satisfyingly touching conclusion. Lhota, who has a superb ear for period dialogue, sets this behind-the-scenes rom-com in a 1940s rehearsal at the Belasco Theatre for a production of Cyrano de Bergerac. As the play-within-the play’s stars (liberally lifting a plotline from Kiss Me, Kate), we have the bitterly divorced old pros, Charles Fontaine and Rosiland Rollins (Mark Pracht and Lisa Herceg, who each clearly revel in portraying these juicy period archetypes). Supporting them are George Hall (Brendan Hutt), an actor who’s gained a reputation for playing greasy villains, but off camera can’t work up the nerve to ask his gal crush out on a date; and the young starlet, Olivia Wood (Kimberly Logan), who’s “over the moon” for her co-star Adrian Young (Shaun Nathan Baer), a clean-cut young man who pines for his own secret love. And, as the inspiration for the play’s title, Gillian N. Humiston plays the feisty Minnie Sparks — Wood’s eager sword fighting double — whose fights are choreographed and coached by her pragmatic older sister, Shirley (Kathrynne Wolf). As the cast starts to unravel due to backstage dramatics, producer Saul Bloomfield (Dan Foss, giving a hilariously underplayed performance) sweats and paces to keep his show Broadway (and possibly Hollywood) bound. There’s a lot to love in this play. From the wonderful period costumes to the play-within-the-play sword fighting spectaculars (a must in a Babes with Blades show), it’s an evening jam-packed with talent and energy. As a huge fan of period movies and, specifically, silver screen icon Rosalind Russell, I have to say I couldn’t take my eyes off Herceg, who seems to have stepped right off a ’40s movie set and into the spirit of the His Girl Friday star. Herceg manages to strike the necessary balance of bemused wryness, love-lorn gruffness, and disarming sentimentality, complimented by a perfectly pitched vocal affectation that’s ideally suited for firing off Lhota’s charmingly vintage dialogue. Herceg sets the bar high, and the rest of the cast rises to her.